The Unemployment Insurance Information for the State of Vermont is an unemployment law poster by the Vermont Department Of Labor. This is a mandatory posting for all employers in Vermont, and businesses who fail to comply may be subject to fines or sanctions. It appears you don't have a PDF plugin for this browser. 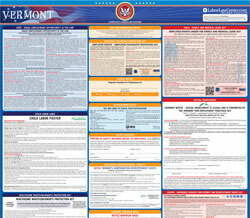 Please see the link below to download vermont-a24-unemployment-insurance-poster.pdf. Emory E. Hebard State Of  ce  Bldg. Auxiliary aides and services are available upon  request for individuals with disabilities. Interpretive services are also available for  persons with limited English pro  ciency. Department of Labor American Job Center near you!